When I first decided to pursue a career in special collections, I had visions of handling fascinating historical documents and helping researchers find that perfect record that would be the turning point in their research. And I do get to do a lot of that! But, I did not realize the extent to which the job sometimes would involve bugs, bad smells, and other unsavory finds. When people put away files—sometimes in attics and basements that aren’t climate-controlled—moisture/dryness, pests, and other challenges may settle in. And sometimes, they leave a permanent mark. Today is the last day of Preservation Week, an observation of these sorts of problems and an effort to bring attention to them—for special collections as well as for individuals and organizations with personal libraries and archives. For MayDay, we’ve put together a compilation of distress calls we’ve seen in our work preserving materials—a preservation Hall of Horrors, if you will—and some guidelines for what to do if you encounter such problems in your own records. 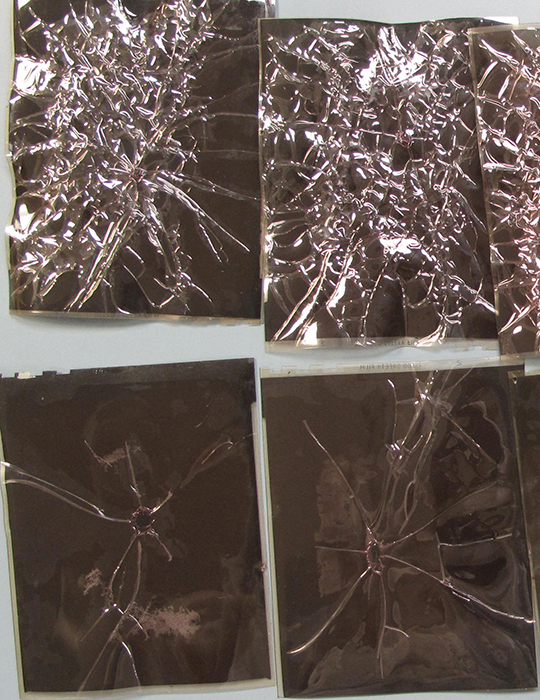 These 4×5 negatives are suffering from vinegar syndrome, prompted in this case by being stored in a non-climate-controlled environment. The physical damage in these is quite evident, but you may be able to detect the telltale vinegar odor before the shrinking and channeling really get going. Once film has vinegar syndrome, it can’t be reversed, but the deterioration can be slowed by housing in a better preservation environment. (Generally speaking, that means not too dry, not too humid, and COLD.) This film may be scanned with some degree of success, but the distortion of the original is now part of the image. 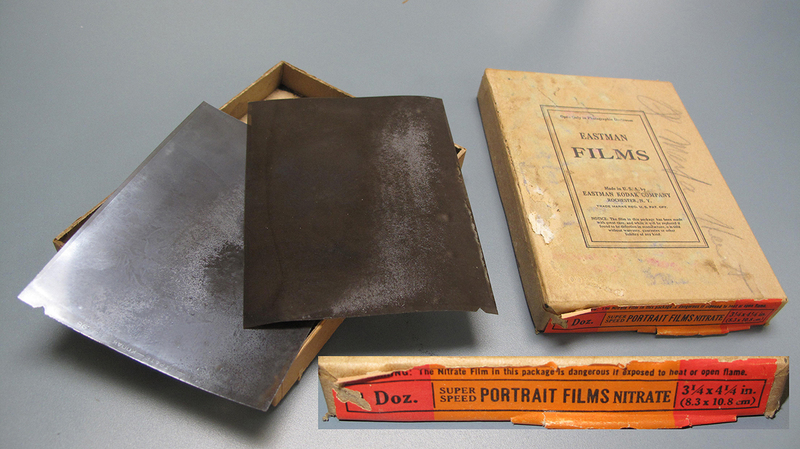 These are degrading nitrate negatives. Nitrate is a sensitive thing to keep around–it is highly flammable and requires an excellent preservation environment. 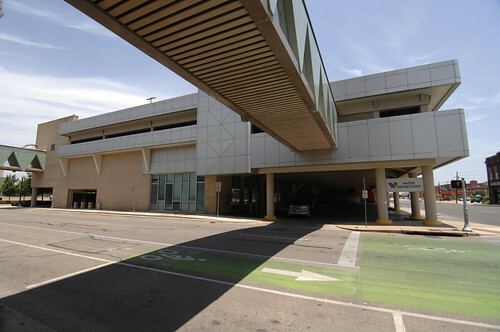 The NEDCC has some good guidelines for recognizing and handling such film. Nitrate was used for photos as well as moving image film. Digitization is often a good option for preserving the images. 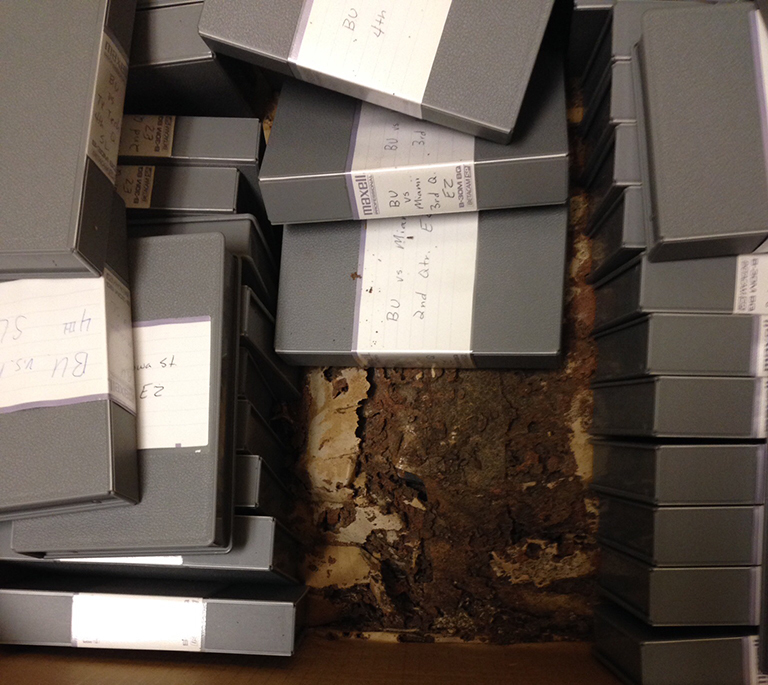 One wouldn’t think that termites would be found in an old concrete stadium, or that they would decide to hang out in a box of Betacam SP tapes. One would be wrong. Unfortunately, the damage inflicted by these pests’ appetite is irreversible. 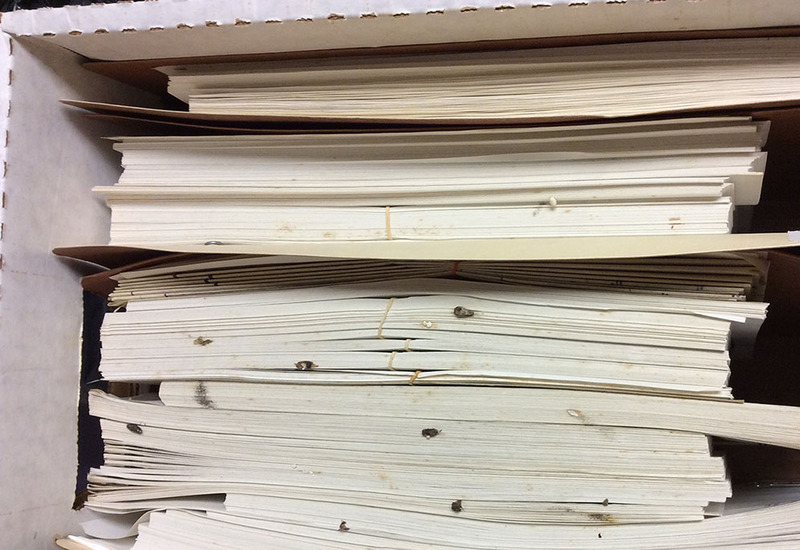 And once pests are known to have been in materials, taking those materials into an archives is a great risk—even if the bugs are dead, you don’t know if they might have laid eggs (which can resist efforts to kill them). And we certainly don’t want to invite the bugs into our space, where they could infest other materials. Prevention is the ideal solution—but if you’re already past that point, check out the NEDCC’s guidelines for integrated pest management. This doesn’t look so bad, right? Well, those little blobs you see on the edges of the pages…those are rodent droppings. Ick. Again, if you can keep the pests away, that would be the ideal. Failing that, you can pretty safely assume that if mice/rats have been here, insects probably were too. So follow the NEDCC instructions above, and then you’ll want to don some protective gear and use a stiff-bristled brush to get the droppings off the records. We’re not even sure what all is going on with this 16-mm film reel container. 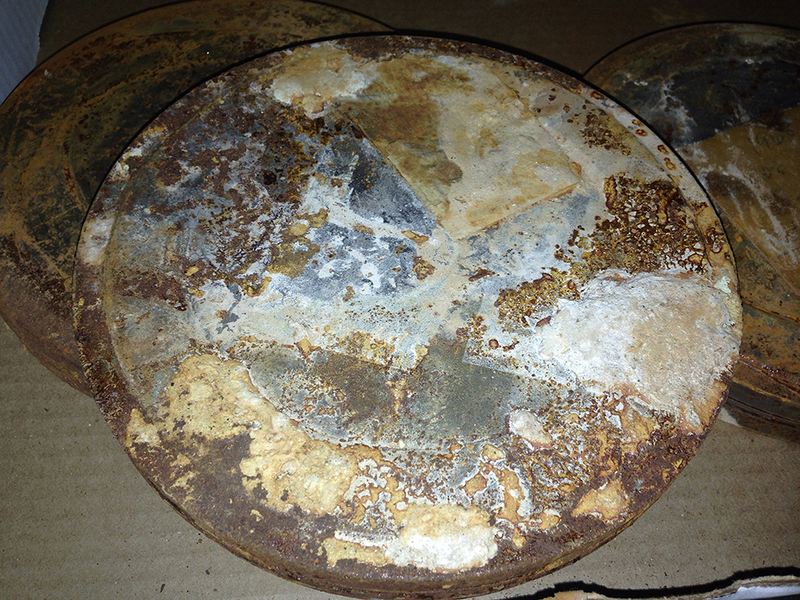 Rust, looks like some mold, too—definitely a health hazard. Fortunately, the contents of a container are sometimes unmarred, so you can carefully rehouse the film and discard the hazmat situation. If you’ve done special collections research, you know that food and drink aren’t allowed. The above sample is an excellent illustration of why we have this rule. That was a cough drop—presumably partially used by the original owner of the records, and somehow, dropped into a file. The cough drop then fossilized its way into the records. Our archivists judiciously used heat (via a blowdryer) and a microspatula to loosen the adhesive properties of the cough drop so it could be removed from the papers. But really? Try not to lose your hard candy or cough drops into your records. We see all sorts of fasteners in the archives, many of which have to be removed because they have became rusty and are eating through papers. Rusty paper clips and staples are enough of a challenge—but the old practice of using straight pins to hold papers together is a particularly pokey problem for our staff. Let’s just say we have added motivation to keep our tetanus shots up to date. To prevent rusty staples and such, try to use coated paper clips and stainless steel staples. 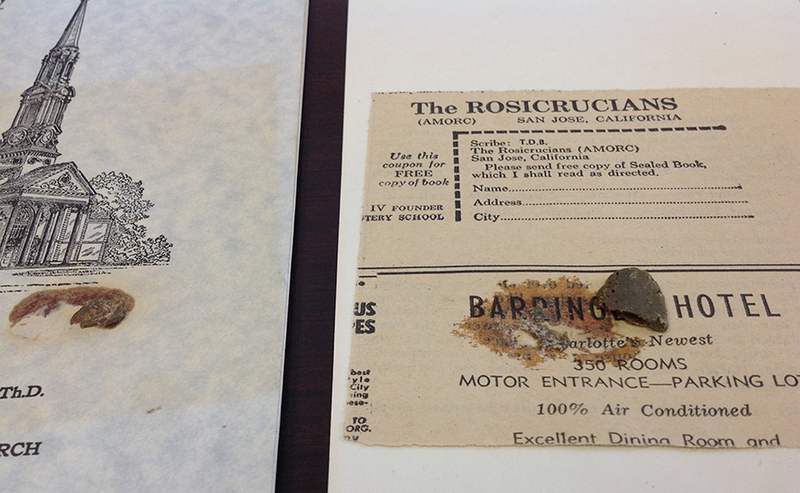 Our print collections staff see many efforts to repair books, some more effective than others. Usually people use adhesives (glue, tape), maybe even try to sew a binding back together. In this case, someone thought they’d try a hammer and nails. As our library preservation specialist’s note says, this was not a success. The primary tenet of conservation is to make sure your repair is reversible. Often, a custom-made book enclosure is the best bet for keeping together the pieces of a book like this one. These items are just a small samplings of the curiosities that can be encountered in old books, papers, and AV materials. We didn’t even get to digital media, which present a whole other set of preservation challenges. Despite the occasional grossness, it is our pleasure to work to preserve and make available our cultural heritage. E.C. Blomeyer and camera, Cameron Park, Waco, TX, circa 1917. Edward C. Blomeyer photographic collection, 1906-1923, number 001. 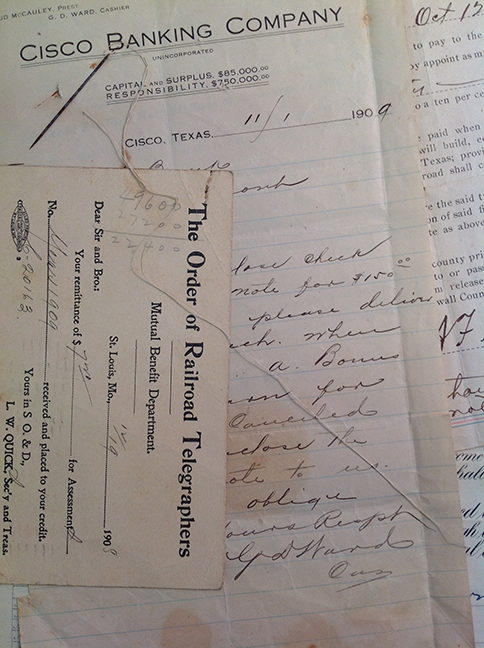 Edward Charles “E.C.” Blomeyer’s time in Texas was brief but well-documented. 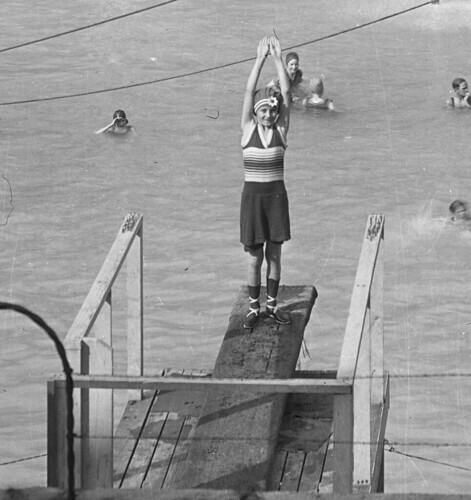 From telephone poles to animals, floods to parades, and much more, the amateur shutterbug committed many views of early 1900s Texas to film—and we reap the benefit today with the Edward C. Blomeyer photographic collection. 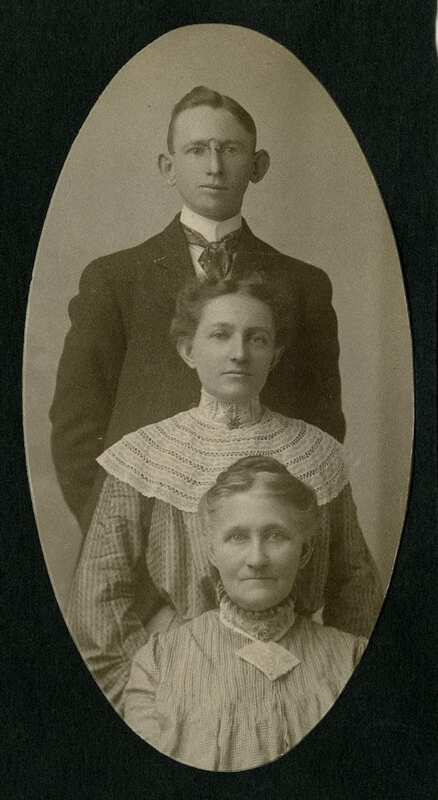 Born in Missouri in 1882, Blomeyer moved in 1912 with his family to Waco, Texas, to work as auditor for the Brazos Valley Telegraph and Telephone Company. He came with knowledge of the telephone industry gained while working for the Southeast Missouri Telephone Company in Charleston, Missouri, where he served as rate collector and in management. He would spend only eight years in Texas, but his knowledge and experience quickly helped to improve a rural, and in some areas quite primitive, telecommunications network. A primitively constructed rural telephone pole serving as a junction point for several lines in Central Texas. Edward C. Blomeyer photographic collection, 1906-1923, number 497-1. 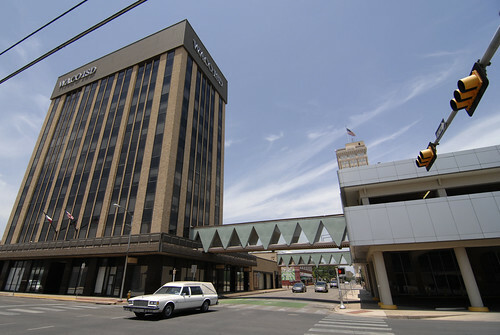 But Blomeyer wasn’t just a career man—he was a photographer as well, capturing many images of Waco. He recorded many scenes of this booming city including trains, airplanes, bridges, rivers, animals, military, the cotton industry, and significant events. His professional interests overlapped with his hobby, providing a rare look into the early telecommunications network in and around McLennan County. These scenes include many early telephone poles—some of which are just sticks with wire attached to barbed wire fence posts! Additionally, Blomeyer documented his travels, with destinations ranging from Galveston, Texas, to Niagara Falls. 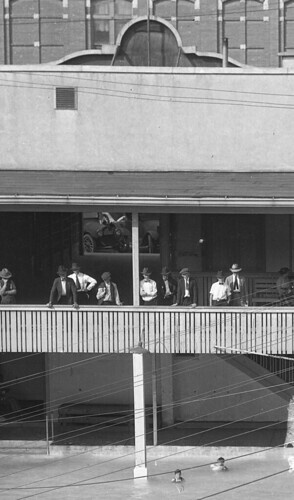 Texas Governor Jim Ferguson is seen here riding in the Texas Cotton Palace parade as his wagon makes its way on Austin Avenue, Waco. 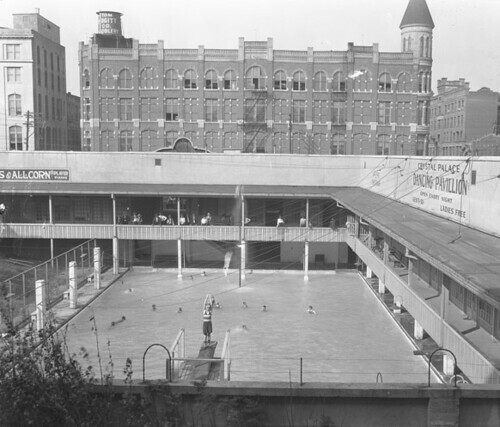 Edward C. Blomeyer photographic collection, number 504-1. In 1920, Waco lost one of its pioneering men in the telecommunications industry. Blomeyer went to work for the Automatic Electric Company, based in Chicago. He stayed with the company as it changed ownership throughout the years, eventually merging with what would become GTE (General Telephone & Electronics). Blomeyer retired from the telephone industry in 1956, having worked his way up to the position of Vice-President of GTE. After retirement, he spent some of his remaining years in Palm Beach, Florida, where he died in 1964. When The Texas Collection acquired Blomeyer’s photographic collection in 2012, consisting of approximately 1,500 photographic negatives and prints, they were neatly filed in a tattered old box. Its original owner or photographer was not known—the seller from whom we purchased it thought the creator was Fred Gildersleeve, a noted Waco photographer. However, Gildersleeve was just the person who developed several of the printed photographs. But we needed more information to tell properly the story behind these photos and the person who took them. The Texas Cotton Palace, Main Building, Waco, TX, circa 1915. Edward C. Blomeyer photographic collection, 1906-1923, number 689-1. The first big lead in our case was a small business card sandwiched between a group of negatives. It read: “E.C. [Edward Charles] Blomeyer, Waco, Texas, President of the Texas Telephone Co.” The subjects in the pictures helped confirm Blomeyer as the photographer and creator of the collection. Now that there was a name to link this collection to, we turned to the Internet. Blomeyer turns out to have been a prolific writer of articles on the telephone industry and its management, photography, and various hobbies, we learned from several digitized magazines. 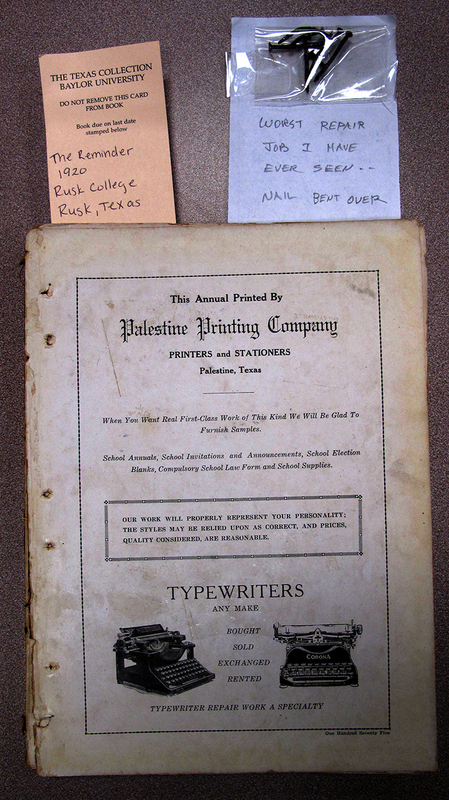 The items in the collection date from 1906 to about 1923. Although he was not a professional photographer, his high-quality work provides a great history of the Central Texas community. Blomeyer was an interesting person to research. He left many traces about what he did professionally through his writings and about many aspects of his personal and family life through his photography. This post shows just a small sampling of Blomeyer’s work—look for our upcoming series on Blomeyer’s photography, Texas in the Teens. We’ll travel with Blomeyer all over Texas (and maybe outside the state, too), and take a look at transportation, animals, and more. Check out our Flickr set below for your first view of Blomeyer’s work. You can see more images in the finding aid in BARD—just do a search for Blomeyer, then enjoy! “Biographical and Personal Notes.” “Telephony: American Telephone Journal” 79, no. 4 ( July 24, 1920): 32-34. Accessed December 11, 2014. “Texas Telephone Co., Waco, Texas.” “Standard Corporation Service, Daily Revised” (May 1-December 31, 1914): 260. Accessed December 11, 2014. Wright, Todd. “Mrs. Blomeyer to be Honored at Dedication of PBAC Library.” Palm Beach Post (Palm Beach, FL), Feb. 27, 1969.